And it's still on the wall. A while ago I found this and wanted to make something like it for the living or family room. I searched the internet for a map. Found one on Amazon. (I didn't link it because I don't know that I'd recommend it for this project. It had a protective finish on it and maybe could have been some of the problem?) The map came quick only to sit in the studio for a few weeks. I finally got around to buying the canvases (40% off) and the Mod Podge. I cut the map in pieces to fit the canvases. I had to trim them all before gluing them. I guess I should have gotten an accurate measurement of the canvases before cutting instead of taking the packing at its word. 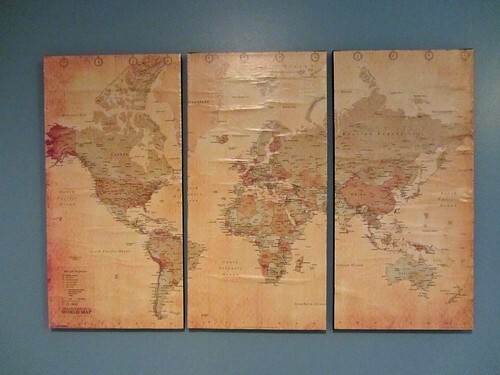 I glued the map to the canvas. I checked back later and saw several bubbles in all the maps. Not good. I put the canvases upside down on the table with books on top hoping to flatten the bubbles. Not much help. I was ready to give up but then decided to finish off the project and see how it looked. To finish I had to Mod Podge over the top of the map. This made the existing bubbles get bigger. I was not happy. When they were dry I stacked them up facing the wall. I didn't want to see them. I talked to Mickey about my failure and came to realize it didn't have to be perfect (or close to it). The imperfections might give it character. So we hung them today before the youth and youth leaders came over for a fireside (SED). The imperfection continued. The center canvas fell off three times tonight. I guess we got a bad batch of command strips. Does anyone have any tricks for using Mod Podge? This was my first time using it. The inspiration piece looks super cool but mine...not so much. All the pieces have now fallen off the wall. What is up with the command strips? Maybe I need to use 10 on each canvas? She mod podges everything. I like your map! I think it looks good!